After tripping over the box for about 2 weeks, I finally went out and built my new sewing table. Its pretty much perfect, and I love how much more space it gives me in the room! It rolls easily over the carpet and I’m looking forward to actually working at it. 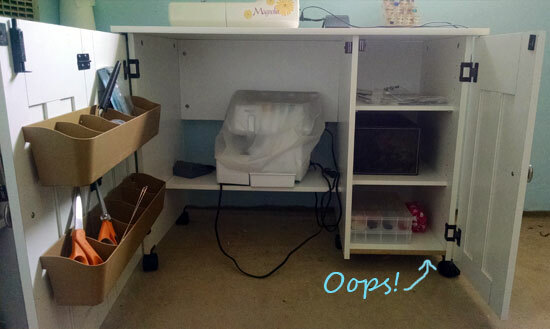 There’s plenty of room inside for my serger, and all my tools that were previously on my other table,but I didn’t notice until I took these photos that I put one of the panels in backwards- see below. Oops! I would have to take most of the table apart though to fix it, and the raw edge is hidden when the cabinet is closed anyway, so not going to worry about it. I also dragged out that huge sheet of 3/4″ plywood that was against one of my walls and put it on the patio against the wall of the garage, threw out some boxes that were laying around, put some more scrap wood on the woodpile, and dumped the trashcan from the side of the house into the big can before taking them out for pick up tomorrow. On the wall behind the plywood, I found another electrical outlet I didn’t know about, but there was also a lot of dust around the window stuck to the wall. Yuck! I vacuumed too to clean up the bits of wood splinters and the little bits of thread and whatnot and it looks much better. I’m going to try to clean up a bit more in the house this afternoon, but no promises because I am so tired. I got up at 6am and did a bit of grocery shopping early- I was happy it was only about 40* and could wear my long coat and my new cowl. I hope that won’t be the only time I get to wear my cowl before next winter. Thank you! I love that my space is finally looking great and getting really organized!